Circus Arts Institute's Aerial Teacher Training is an in-depth safety and technical training for anyone who is currently training in, teaching or wants to teach (or co-teach) Aerial Arts to others. With this training, you'll be a more mindful, safety-conscious and effective teacher (or student) of the Aerial Arts. With a certification, students will know that you are highly-qualified to teach and have the highest professional standards and education. ​4 levels of certifications are available through the Circus Arts Institute: Beginner, Intermediate, Advanced and Trainer. ​those apparatus are added based on demand. Keep taking classes until you come train at the Circus Arts Institute (CAI). Go back to your studio and start spotting then co-teaching. After practice hours are completed, and recorded on your application, and you're ready, come back for a qualification or assessment at CAI! Record past teaching hours as practice hours on your application. Come train at the Circus Arts Institute (CAI) and take a qualification or an assessment. If more practice hours are necessary, we'll send you to your home studio with what to work on. When you're ready, come back for a qualification or an assessment. at CAI! When you're ready, come back for more training and take a qualification or an assessment. at CAI! 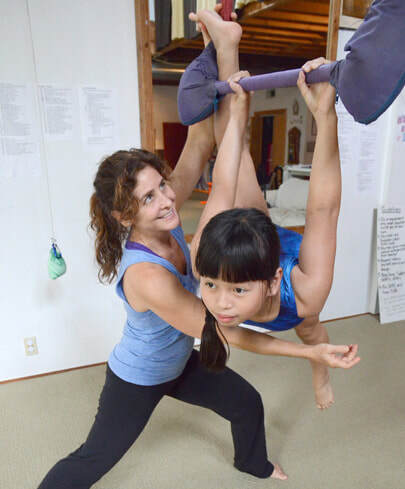 If you have a program and are interested in offering classes to special needs person(s), you may be interested in Adaptive Aerial Teacher Training for your staff.